VISIT OUR SILVER JEWELRY CATEGORY FOR OUR CURRENT SELECTION. 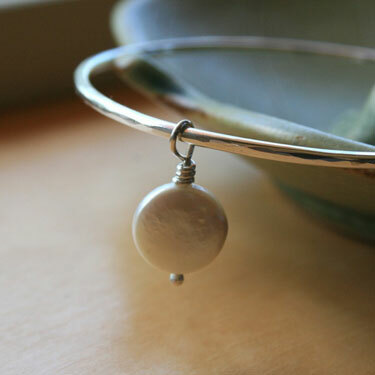 Large, plump, freshwater coin pearl slides freely around this hand forged bangle. The bangle has been shaped, hammered and polished to a lovely shine. Bangle is 2mm (1/16") thick and is 2 +" in diameter. Bracelet is 2mm (1/16") wide. Made with Nickel-Free Sterling Silver. This bangle looks great worn singly or stacked with other. It would be a perfect wedding accessory for the bride or bridesmaids. Each Piece of artisan jewelry is handmade by Kira Ferrer in her studio on the island of Maui. Her work is inspired by the lush, natural beauty of the island. Her designs are created to enhance the beauty and individuality of the person who will wear them. We guarantee our Sterling Silver Mermaid Bangle with Coin Pearl to be high quality, authentic jewelry, as described above.